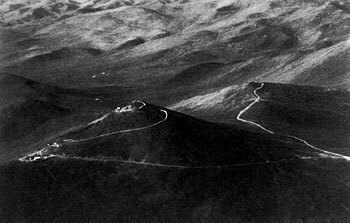 4 December 1990: The Council of the European Southern Observatory, in session today at the ESO Headquarters in Garching near Munich, unanimously decided that the world's largest optical telescope, the 16-metre equivalent Very Large Telescope, shall be placed on Cerro Paranal , an isolated mountain top at 2664 m altitude in the central part of Chile's Atacama desert, some 130 kilometres south of the town of Antofagasta and 12 kilometres from the Pacific coast. 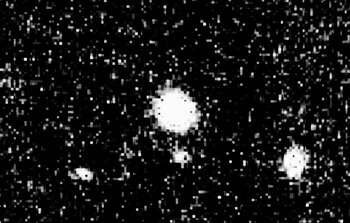 29 September 1990: By decree of the International Astronomical Union, a newly discovered minor planet (asteroid) in the solar system has been given the name Portugal, honouring this European country. 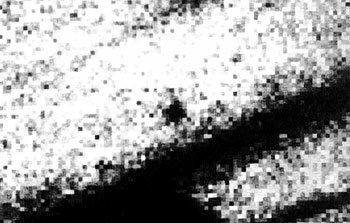 No "Missing Mass" in Opaque Spiral Galaxies? 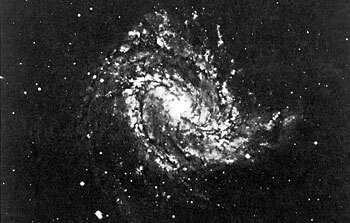 27 September 1990: A long-term astronomical study of spiral galaxies, initiated almost a decade ago at the European Southern Observatory, has recently produced intriguing results about the presence of cold matter in the Universe. 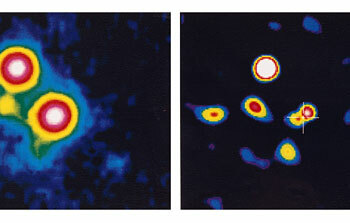 They have a direct bearing on the so-called "missing mass" problem, one of the major unsolved riddles in astronomy. 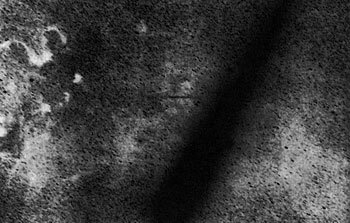 25 September 1990: These impressive photos of Comet Levy (1990c), one of the brightest comets in recent years, were obtained with the ESO 1-metre Schmidt telescope at the ESO La Silla Observatory, on September 12 and 14, 1990. On these dates, the comet was 104 and 111 million kilometres from the Earth and 179 and 176 million kilometres from the Sun, respectively. It will reach its perihelion (the point in the orbit which is closest to the Sun) on October 24. 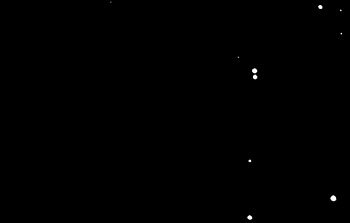 26 July 1990: Famous Comet Halley, now receding from the Sun after its perihelion passage in early 1986, has recently entered into a state of hibernation which will last until shortly before the next passage in 2062. 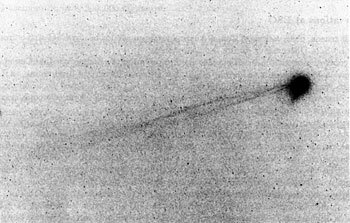 13 June 1990: Most of the dust that is ejected from a comet's nucleus (i.e. the "dirty snowball" at its centre) assembles in a thin “sheet'' near the orbital plane in which the comet moves around the sun. 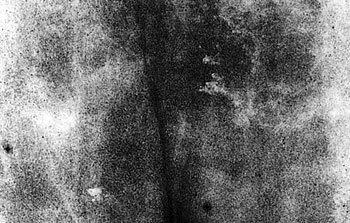 This sheet is very thin and is difficult to observe unless it is viewed directly from the side. On June 6, 1990, the Earth crossed the orbital plane of Comet Austin, allowing such a unique, side-on view. 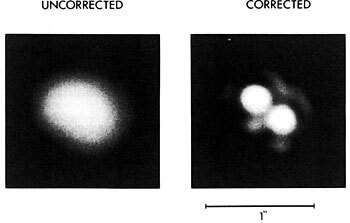 23 May 1990: With the help of "adaptive optics," a revolutionary optical concept (eso8908), infrared astronomical images have been obtained with the ESO 3.6 m telescope at the La Silla observatory which are as sharp as they would be if the telescope were situated in space. This is the first time in astronomy that a ground-based telescope of this size has been able to directly register during long time periods stellar images with a sharpness that corresponds to the theoretically possible limit. 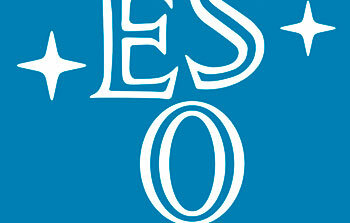 Discoveries in the Southern Sky: ESO Exhibition now at "Microcosm"
9 April 1990: Paris, Brussels, Vienna and Copenhagen were some of the stations for ESO's travelling astronomy exhibition. Now this exhibition can be seen for the first time in Switzerland, where CERN's MICROCOSM exhibition has opened its doors for a detailed view at the World of stars and galaxies. 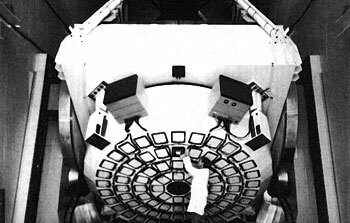 6 February 1990: In the presence of a distinguished audience of ministers and high-ranking officials, as well as representatives of European industry and scientists from the member states, the European Southern Observatory today officially inaugurates its revolutionary 3.5-metre New Technology Telescope (NTT). 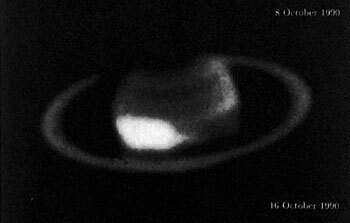 26 January 1990: The California Institute of Technology (Caltech) of Pasadena, California, U.S.A. and the European Southern Observatory have concluded an agreement by which ESO will undertake the responsibility of producing high-quality copies of photographic sky survey plates obtained with the Palomar 40-inch Oschin Telescope and to distribute the resulting photographic atlas . 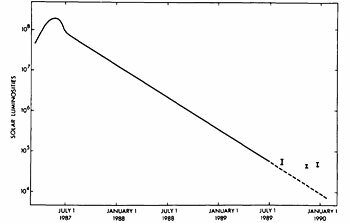 5 January 1990: Is there - or is there not - a pulsar in Supernova 1987A? This is one of the main enigmas in current astrophysical research, and nearly three years after the explosion of the first naked-eye supernova (see eso8704, eso8705, eso8706, eso8711 and eso8802) in four hundred years, the answer is still not known.